This post is a summary of the presentation which I gave as the keynote for the Lulea University of Technology Higher Education Conference. Below is a summary of my presentation, including the feedback received by the participants during the session, when we broke to process the information. The PLN – is it really anything new? Professionals have always had networks for informal learning. They have always sought out others for advice, read journals and participated in conferences. They have had strong connections with some colleagues, and looser ties with acquaintances, which they have called upon when they have needed to solve a problem, or to chat with after a particularly hard day. The difference between these networks and the PLN is that previously, the network was limited. It was limited by an individual’s geographical location, by their capacity to travel to other places to attend conferences and professional development. It was limited by the number of people who were working in a particular context or area. It could also be limited by the types of books, journals and other publications that could be accessed. The internet, and more specifically, social technologies, means that the PLN no longer has these limits. A professional can now connect with other professionals from all over the world. There is a wealth of information, resources, research available at the tap of a keyboard. It is no longer necessary to call colleagues during working hours to solve a problem, and in fact, you can ask a question through your PLN, and receive a huge range of different responses to evaluate, rather than just that one person you called on the phone. My research has revealed that the possibilities for learning now that we have this connective potential are almost unlimited. However, just as traditional, face to face networks are constructed over time, and require particular skills and strategies, so to do online PLNs. Creating connections with people, information and resources does not just happen overnight. Developing a PLN that is really useful and that leads to rich learning experiences and opportunities requires a strategic approach, and the network that is developed is personalised to every individual. In 2018, students graduating from university who have the capabilities to expand and extend their PLN will have an advantage over those who are not able to use social technologies to connect as widely. These capabilities can be developed while they are completing their studies. However before we can begin to teach these capabilities, we need to really understand why it is that a PLN is important, and what exactly it is. 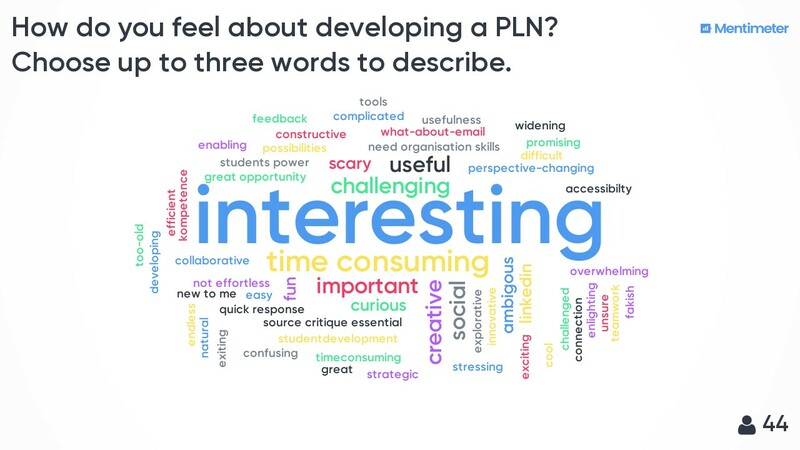 Part One: So what is a PLN? Firstly, and perhaps most importantly, a PLN is personal. No one can create a PLN for you, and every individual’s PLN is different according to their learning goals, their professional interests, the connections that are made and the commitment to interacting and participating. The paradox of the PLN is that although it is a personal network, it is based upon social learning. The learning that takes place is through interactions with others, but it is driven by the individual. One way to understand this is to see the learner as similar to the conductor of an orchestra. I have blogged about this before, but here’s a summary. The conductor has a goal that is singular – to draw the best from each player, and to bring their playing together to create magnificent music. The musicians in the orchestra represent the ‘nodes’ or contacts of the PLN – the people, information or resources that the conductor creates connections with in order to achieve this goal. Just as every orchestra has a conductor, every PLN is determined by the autonomous individual, who drives their own learning according their interests, passions and learning needs. Whether a PLN offers a successful learning experience is dependent upon the individual’s actions, although they require the contributions of many others in order to learn. The PLN is about learning. My research has found that there are three different arenas of learning that can be accessed through the PLN. The first is pedagogical – or practice based learning. When teachers asked their connections questions about curriculum, about resources to teach a particular topic, or about how to teach a certain subject. Teachers used their PLN to stay up to date with current and best practice – reading blog posts and articles shared by colleagues, or subscribing to newsletters or updates. Sometimes they collaborated online with others to jointly construct or review planning or curriculum documents. The second arena of learning was personal. Having a network of colleagues and connections that they could share with helped some of my research participants develop a better sense of their profession. They could gain a wider perspective of the working conditions and experiences of others beyond their own context. If they shared stories of their practice, they received feedback which boosted their confidence and gave them a feeling of being a part of a larger community. Some teachers said that their self confidence grew when they could mentor or advise others in their network, or that they overcame feelings of isolation when they found like minded professionals online. The third arena of learning was public. This type of learning came about when individuals shared evidence of their good practice online. Learning through a PLN is not just about accessing information – it is about creating and sharing content also. Over time, this content builds to become an online professional presence. Learning in the public arena happens when individuals experience opportunities to extend themselves professionally in ways they would not have necessarily been able if they did not have a PLN. For example, some of the teachers who had shared advice and expertise regularly online were asked to present at conferences, or were invited to apply for promotions based upon the evidence of their knowledge and practice that they had publicly shared. They sometimes became leaders online and offline as a result of their participation with their PLN. Finally, it is important to understand that a PLN is a network. This is tricky, because even in the research the word network is often conflated with a community. If you are interested, here’s a blog post that I have written previously which explores these concepts. If time is short, I’ve summarised below. A lot of the time learning communities and learning networks are treated as the same thing and yet they are quite different. Whether it is online or offline there are certain aspects that differentiate communities and networks. The features blur across these social structures, so the information below is not a set of hard and fast rules, but general features that have been identified of each. The first is structure. Generally, a learning community is formed intentionally by a group of people who know each other. This means they have strong ties, which is another way of saying that they interact regularly and that there is a level of trust between them. Because most members of a community will know each other, when one shares something with the group, it is more likely that this will be reciprocated and others will acknowledge this. The membership of the learning community is known – even if members don’t know each other well there is generally I sense that everyone is working together towards a shared goal such as the completion of a course or task. Learning network can include members of a community, but networks tend to be more organic, undefined and have both strong and weak ties. This means that there will be some members of the network who are known to each other and others who may be unknown. The membership of a network is far more flexible and usually changing all of the time. The goals are personal to each individual, and while members might work together, they may be working towards different goals. I want to know what a PLN looks like! Everyone’s PLN looks different. As part of my research I asked participants to share a drawing or visual representation of their PLN. The differences were astonishing. It is not possible to ask students to ‘create’ a PLN. The PLN is what happens as a result of particular interactions online. These interactions can be supported, and the capacities needed to develop the connections with others can be developed through different activities and learning opportunities, but the end result, the PLN, will always be personal, and always changing. Click on the images below to view them in a new window at a larger size. This teacher said her PLN drawing was just a snapshot of this particular month. She explored the different interactions that she had with people, and the serendipitous and unpredictable way that one interaction led to another. Here, the participant said that she saw her PLN as a global extension of her brain. She has a world map, the WiFi symbol, and her brain in the centre. This PLN map is slightly different. 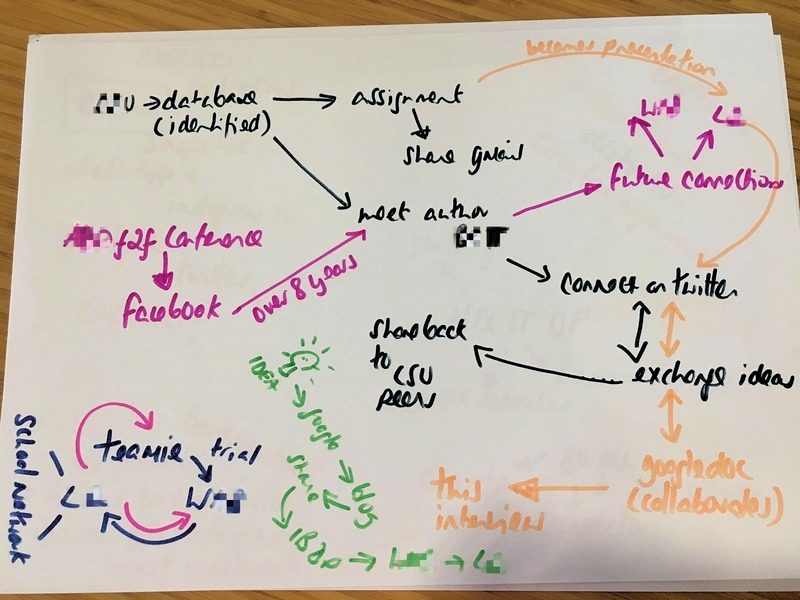 This is the map of a student who was involved this semester in a subject called Connected Learning. 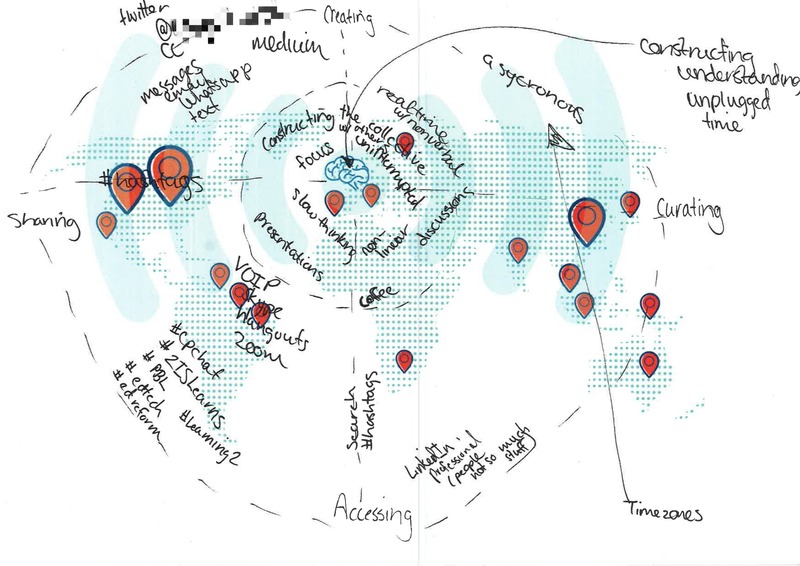 In this subject, the participants were asked to map their PLN as it existed at the beginning of the subject, and again at the end after they had been given lots of different opportunities to develop their knowledge of connected learning. 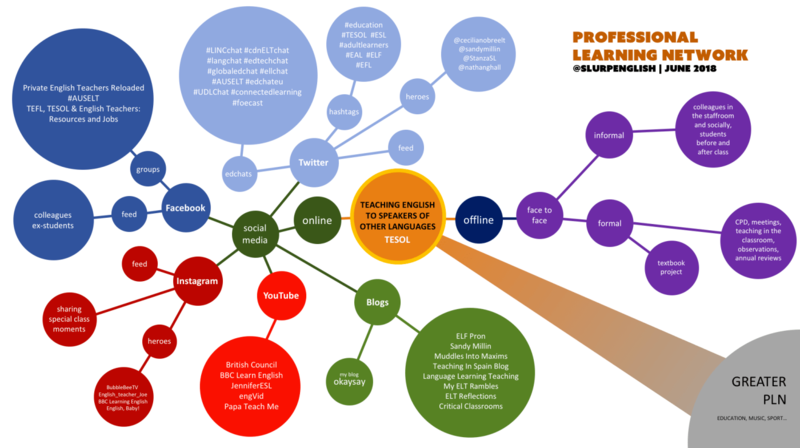 You can see that the updated PLN map shows how this student had developed many new connections across different platforms and social technologies. They had become aware of different ways to connect with others and had started contributing their own thoughts and reflections – which increased the interaction that they had with others in their network. 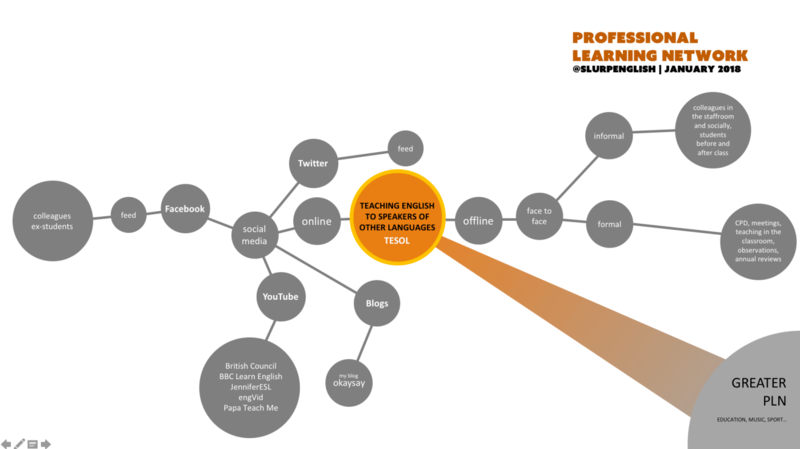 The experiences of the teachers in my research led me to realise that the PLN offers individuals the opportunity to learn as a connected professional. From the professional learning perspective, a connected professional is aware of how their online and offline networks can enhance their continued development. They seek learning that not only informs their practice, but also helps them develop a sense of who they are as a professional, and to understand their place within the profession. They are open and contribute their own thoughts, opinions, experiences and resources to their networks, so that others may also learn with them. They collaborate with others to construct new knowledge and understandings, and are self-directed in seeking out new opportunities for further growth and development. Connected professionals work to develop their professional identity across their networks both online and offline. The PLN allows people the opportunity to connect with others from similar and diverse backgrounds, regardless of their geographical location. It democratises connections, and there are fewer hierarchies and formal channels – there is never any harm in asking a question, and responses may come from the most unexpected of places and people. This was such an inspiring point of the presentation, because as you can see, the largest word is clearly ‘interesting’. What a positive response! The word cloud presents the most commonly entered words as the largest, and so you can see what most people are thinking quite clearly. Other interesting observations were that it sounded time consuming, which can be true – a PLN can take as much or as little time as you allow, and developing strategies to build it into your workflow and manage the time committed were a strong feature of my research also. Happily, the words useful, challenging, important and creative also featured. For some, the ideas were overwhelming, scary and ambiguous – and this is fair enough! The idea of being able to step into the flow of ideas and conversation happening 24-7 all over the world is a huge one to consider, and the first time we hear about something new like this, these are natural responses. The best thing about a PLN is that it is on your terms – you can step in as slowly as you like, engage as much as you like and access it when and where you like – it is truly personal, and this can help to make it feel more manageable! It is clear that developing a PLN is not a single task. It is a network which develops over time, both online and offline. The ultimate goal is to have students who are digitally literate, who are confident creating and maintaining connections offline and online. Who have, what Bridgstock labels as connectedness capabilities. The PLN that they initiate while they are students will continue to grow and change as they enter their careers. Students who have developed connectedness capacities during their studies will leave university knowing how to make connections online which will help them across a range of areas. They will be able to seek answers to issues and solve problems in their practice by accessing the expertise of others and information which is available online efficiently and effectively. This will improve their employability, as they will be able to maintain their professional learning well beyond their formal study. They will have begun to develop a support network of colleagues who can provide them with professional support. By interacting with and sharing content online, they may have begun to develop an online professional digital identity, which may raise their reputation and give them a forum for sharing their strengths and talents. They may experience opportunities which challenge and extend them, as they are able to connect across their field, and even beyond their own areas of expertise. Leadership and innovation often arise from the cross-fertilisation which can happen when connections are drawn from different areas which result in new and creative ways to solve problems. Supporting students to develop their PLN is an ongoing process, which can be embedded within the pedagogical approach of the university – let’s look at the different ways this may happen. It is not so much about the content that is taught, rather it is about rethinking how it is taught. Many of the pedagogical approaches used up until now reflect a time when we didn’t have access to networks of individuals and resources at our fingertips. Anyone can now search for generic information and read it from the internet. What universities and the expertise of the teaching staff can offer is learning opportunities which are far more personalised and contextualised. The pedagogical principals developed that you have been working through today suggest that excellent teaching offers pedagogy which is challenging, related to students’ contexts and the professional context that they are entering into, authentic, flexible and centred around the student. I would suggest that when we embed the digital and network literacies students use to develop PLNs, we are offering this to students. For example: Rather than having a tutorial where the teacher is at the front of the room giving the students information, why not send the tutorial topic to students prior to the tutorial in the form of a question for debate. Expect the students to come to the tutorial with a personal position on this topic, ready to back up their opinion with data. Invite an industry professional to ‘skype/zoom’ in for the 45 mins to share their opinion also. Run the tutorial like a business meeting not like a traditional classroom. At the end, have students reflect on their experience by blogging their thoughts (publicly or on the intranet). Next tutorial – students must have commented on two peers’ blog posts. This is challenging for students (they have to know their stuff, and be able to express it), contextual (it is related directly to the content they are learning and has industry links), authentic (it is similar to what they will have to do when they join the workforce), flexible (the topic of debate can be changed, the length of the discussion, number of individuals present all can change as needed) and driven by students rather than the teacher. The students will learn from this skills including how to relate to an industry professional (important for them if they are to create connections with them) how to present their opinion appropriately but persuasively (another important skill for when discussing online through PLN) and may wish to share their reflections publicly and thus create possibility of an online presence which they can reflect on as time passes. Another element of the principles for effective teaching is the student learning experience. Learning through a PLN requires that individuals are active, participatory, open, self-directed and exploratory. However students need to have the opportunity to develop the skills and capabilities that enable them to do so. There is much more involved in learning through a PLN than just ‘signing up’ to a number of different online tools and ‘following’ people. Students need to have experience in participating in online discussions. They should be able to create digital content, which they are then willing to share with their colleagues. They need to know how to give constructive, positive feedback to others, and how to receive feedback and to iterate their work based on this feedback. Students need to feel confident in the online space to explore, to critically evaluate what they find and to then apply this to their own context. All of this sounds like a lot of ‘extra’ teaching on top of what is usually included; but a lot of this can be taught through the design of the task. For example, instead of asking students to respond to a task with a powerpoint presentation, why not ask them to create an infographic. Using the app Piktochart which requires no more technical skill than drag and drop, students can create a visual presentation of their work, which they can then share – with their colleagues, in the LMS, and to the wider community using Facebook, Twitter, LinkedIn. They can demonstrate their content knowledge, their capacity to reference their work, the ability to succinctly summarise meaningful aspects of their learning – and have created an authentic resource that might contribute to the learning of others. These suggestions suggest many different ways pedagogy may become more student centred and more authentic – reflecting the learning that is possible with connective social technologies. One thing we need to remember – for students, this is all new also. They may be happy and familiar interacting with family and friends online, but their experience of education is likely to have been one mostly designed around the model where the teacher gives information, and they receive. To be asked to take a more active and participatory role in their learning is often a new experience for students, and one which they may struggle with at first. Scaffolding their development as they grow the skills to see themselves as developing connected professionals is important – and it will take time! Back to the cocktail party! 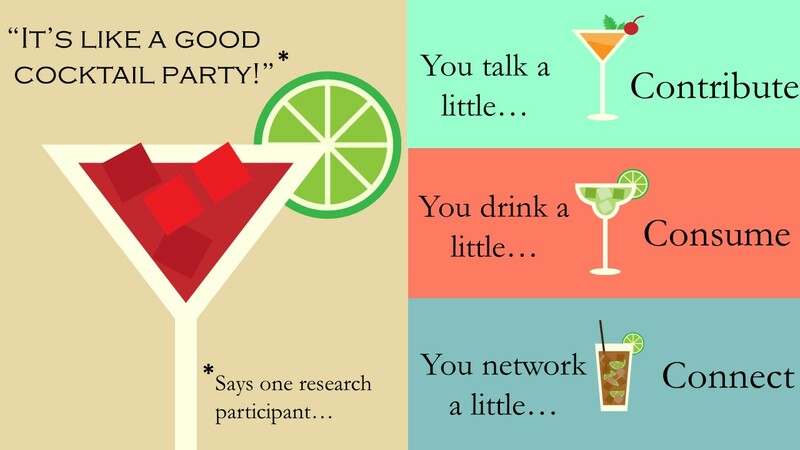 One of my research participants suggested that in her experience, learning through her PLN was just like going to a fabulous cocktail party – and in many ways it is exactly like that! At a cocktail party you meet new people and make connections, just as with the PLN. You partake in some food and drink – which is like accessing the wisdom, information and resources of the PLN. You also share your own thoughts and opinions at a cocktail party – and this participation is also an important part of learning through a PLN. Let’s look at a few more pedagogical approaches that can help students develop the capabilities they need to successfully connect and participate in their own PLN. Traditionally, information for learning was sought from only a few places, and these sources had usually already been reviewed for accuracy and relevance. Peer reviewed journal articles, books that had been edited and published – almost all information had to go through a critique before it was distributed more widely. Learning through a PLN means accessing information from a wide range of sources – and these sources vary widely in quality and credibility. Critical evaluation of information is an essential for everyone – not only students! Accessing information from so many different sources can mean that we get a more varied viewpoint, and that we can compare different opinions to identify bias, weaknesses in argument, inaccuracies – but it also means that nothing can be immediately trusted. Consider exploring relevant Wikipedia pages to evaluate the accuracy of the information, identify and supply references where needed, look at how the page has developed over time and the controversies or discussions that have occurred as the page has been constructed – or create a Wikipedia page if none already exists, then observe if any alterations are made; by whom…why? Ask students to research the digital professional presence of authors of research papers using Mendeley or Researchgate. Compare research articles and popular press on a topic which is being studied to identify how research information is being portrayed to the general public. Do a social media search on topic currently being examined to identify the accuracy of opinions held by the general public on a particular concept. Contributing is an important part of developing an active role within a professional community. However, students can lack confidence, may be afraid to make their own thoughts and opinions public as they may not feel as though they are in a position to take part in public debate. Building the skills and confidence to participate is part of the learning process. I share my thoughts and welcome feedback and critique – if I am incorrect, or have a misunderstanding, I would rather that be pointed out to me, and the error in thinking explained to me than for me to continue thinking I am correct. It is how you share your work with others that encourages constructive feedback – although if you receive negative feedback this can also be a learning experience – we need to know how to cope with this also. Students can often build their confidence by developing their work within the LMS, seeking feedback and advice from fellow students and teaching staff, and after being assessed, then share in a public forum with more confidence as they have had the opportunity to refine their work before sharing it more openly. Creating a blog space to act as a digital portfolio can be one way students can begin to develop their online presence. They can share work they are particularly proud of, their reflections on learning, recent learning experiences, record events such as participation in conferences, professional learning opportunities etc – it becomes a record of their development over time. Future employers can gather an idea of what the student values, how they have changed over time, their approach to learning. They own the data – it is better to have the content in a space that they have control over, then share this to different interfaces such as LinkedIn rather than develop all of this proprietary and then place it in a space they don’t have control over. Creating connections using social technologies isn’t something that just happens. There is an etiquette to creating a professional digital presence which is informed by how individuals manage their privacy, how they present themselves and develop their ‘brand’, how they relate with others online. The way to develop these capabilities is by having opportunities to interact with others in an authentic context. The first step may be by commenting and offering feedback on colleagues work – even within the LMS. Modelling how to construct a useful and appropriate comment may be necessary. Often, students have only had experience with interacting with their friends and family online – and this is a different style of communication to that needed in professional interactions. Including in assessment tasks that students must offer feedback on a number of their peers’ work, interaction with forum discussions or creating opportunities for group interaction (for example developing a class Google Plus community, or Facebook group) can all be ways in which students may be scaffolded to develop these skills. Developing a PLN is an ongoing journey. New connections are initiated, treasured strong connections are maintained, some connections are lost over time and as interests and needs change. The first part of creating a PLN is stepping into the flow. As someone who has been learning from others and experiencing many opportunities from my connections for a long time, I welcome and encourage others to join me. Please feel free to use the comments section in this blog, or to connect with me at @kayoddone on Twitter. I would love to answer questions, work collaboratively to develop new projects, be challenged by your own thinking. My learning never ends, and this, for me, is the joy of a PLN. So I leave you now with the challenge; and look forward to connecting with many of you for new and exciting learning adventures!